Software engineer Mike Caldwell shows the front (R) and back (L) sides of a physical Bitcoin he minted in his shop on April 26, 2013 in Sandy, Utah. Bitcoin is an experimental digital currency used over the Internet. US authorities seized the accounts of a Bitcoin digital currency exchange operator, claiming it was functioning as an "unlicensed money service business," court documents showed. US authorities seized the accounts of a Bitcoin digital currency exchange operator, claiming it was functioning as an "unlicensed money service business," court documents showed Friday. A warrant revealed by the Department of Homeland Security showed a judge signed the seizure order Tuesday for the accounts of Mutum Sigillum LCC, a subsidiary of Japan-based Mt. Gox, the world's biggest Bitcoin exchange. The warrant said the account based on the electronic payments platform Dwolla and held at Veridian Credit Union "was used to move money" as "part of an unlicensed money service" in violation of US law. 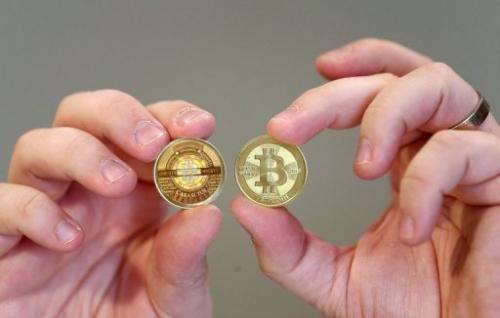 The US law enforcement action creates doubts about the future of Bitcoin, a mysterious digital currency which saw a flurry of interest this year which some called a bubble. A form of "e-money," Bitcoin is made of strings of dazzlingly complex code, written in such a way that it becomes increasingly difficult to generate new Bitcoins, with the number in circulation designed to eventually top out at 21 million. Originally worth less than a cent, the value peaked during the Cyprus financial crisis at $266. On Friday the price listed on the Blockchain website was $118. A Homeland Security official said that the agency could not comment on the matter "in order not to compromise this ongoing investigation." Well what did you expect? You didn't think the money was yours, did you. So much for flaunted 'freedoms'. yes, but Amazon currency is not anonymous and amazon will let the NSA peep in your account. Btw i find that Bitcoin has defeated its own purpose by becoming a speculation coin, we don't need another form of speculation to tackle the financial crisis caused by speculation. What i would like to see is an anonymous anti speculation coin that has a daily exchange rate that is the average rate of the big world currencies combined: dollar/euro/yuan/yen/roebel. Seems like the powers that be are getting scared - and are starting to lash out. They know that if they cannot control the currency and artificially inflate/deflate it to siphon wealth off of the working class then they're done for. This is just sad. New innovation comes along that can do a lot of good, and US lawmakers want to shut it down. What a surprise. The world needs to somehow band together and put pressure on America to stop it from interfering with the world and the internet. America's influence is stopping progress. Ooh, playing the terrorist card! Terrorists, arms dealers, drug cartels, oil cartels, bankers, mercenaries, pirates, child pornographers, and prostitutes (including politicians) all prefer the US Dollar. And the "national security" apparatus wants to keep it that way. I share your feeling about a non government controlled coin, but it can't be a trustworhy for the people coin if a small group of slick investors can make it jump up and down like crazy on our expense, i just wish the PiratyeBay came out with a relatively stable coin. which pretty much reflects the Purchasing Parity Power in relation to the GDP, so a long if you have your MacCoin you don't grow hungry. And I bet lots of youz voted Obama. The state has granted itself a de-facto monopoly over currency. Any attempt to circumvent it is met with force and coercion. The claims about bitcoins being used to launder money are a lame attempt at diversion, to get the public to endorse the crackdown. All currencies are used to launder money. This is straight out of Animal Farm.